GE: What is the history of your ministry? 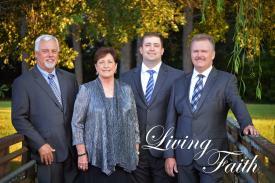 Living Faith was founded 23 years ago as a southern gospel singing ministry born out of Living Faith Baptist Church in Good Hope, Alabama. During the course of time, we have shared our ministry in several states and all types of venues. GE: Where did you begin? Our ministry started as church friends that love to sing about Jesus! GE: Why did you choose this path of ministry? The message in the songs! Our contentment comes when we hear testimony of how our ministry has touched and blessed those we come in contact with. GE: Who are some of your major musical influences? Eric Bennett has been a long time friend of our group members for well over 30 years. Eric is always there for us to give that word of encouragement. Other groups that have influenced us are Cathedrals, Gold City, Kingdom Heirs, Perry's, just to name a few. GE: Why do they affect you the way they do? They are singing the gospel of Jesus. GE: Who has been your biggest spiritual influence? Each of us have a person that holds a special place in our heart that has been a major influence to our spiritual growth. We all agree the ones we respect, teach the word of God. GE: How many dates to you do per year? With our work obligations, our goal is 75-100 dates a year. GE: What kind of venues do you sing at? Any where 2 or 3 are gathered in His name! Barns, Churches, Civic Centers, any where there is a need. GE: Are you involved in other areas of ministry besides music? We each serve in our churches when we can be there. GE: Where do you see your ministry in the next 5 years? Our goal is to continue to go and do as God opens doors. GE: Talk a little bit about your current project and/or single? We just have completed a new project entitled This Is Why. We are currently finishing what will be our new single, I See Jesus. We will have this song to radio in a few short weeks. The response we are getting on this song is truly amazing! GE: Who are the members in your group? Rodney James, Lead. Nathan James, Baritone. Mary Mooney, Alto. Mark Byrd, Bass. GE: Tell us a little about your family, husband/wife and children. Rodney James and his wife Cathy, Nathan James and his wife Tiffany, Mary Mooney and her husband Terry, Mark Byrd and his wife Sandy.